Juminda is a village in Kuusalu Parish, Harju County in northern Estonia. It is located on the coast of the Gulf of Finland, on top of the Juminda Peninsula, on the territory of Lahemaa National Park. Juminda has a population of 35 (as of 1 January 2012). Juminda was first mentioned in 1290 as Jumentake. In the Middle Ages Juminda was inhabited by the Swedes. There's a 25 m lighthouse whish was built in 1937. In August 1941, one of the deadliest naval battles in the world took place near the Juminda peninsula. It was part of the Soviet evacuation of Tallinn when the Soviets planned to evacuate parts of the Baltic Fleet from Tallinn to Leningrad but were stopped by a 32 km long strip of mines placed by the Germans and Finns. The convoys consisted of few hundred ships, some of them passenger ships carrying Estonian and Latvian citizens. According to historian Mati Õun, 52 ships were sunk with up to 25,000 people on board. In 1972 a memorial stone was established in Juminda. Estonian-Swedish politician Enn Kokk (born 1937), was born in Juminda. ^ a b c "Juminda küla" (in Estonian). eestigiid.ee. Retrieved 5 June 2012. ^ a b "Rahvastik" (in Estonian). Kuusalu vald. Archived from the original on 2 July 2012. Retrieved 5 June 2012. 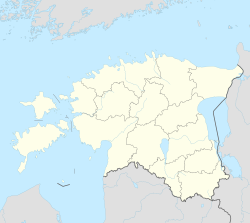 This Harju County location article is a stub. You can help Wikipedia by expanding it. This page was last edited on 12 January 2019, at 03:13 (UTC).